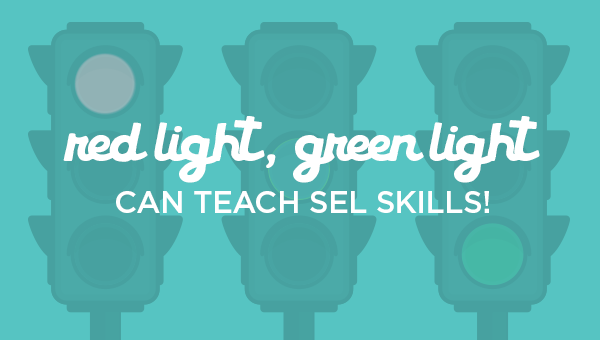 Red Light Green Light can teach SEL skills! Teaching SEL skills is not hard. It’s fun. The old game Red Light, Green Light is not only fun, it teaches self-management, specifically self-regulation. Engage the child’s flexible memory by changing up the rules. Instead of Red Light, Green Light, play Purple Light, Brown Light. Now the child must use what is known from the original game to correctly play the new version of Purple Light, Brown Light. Social and Emotional Learning (SEL), according to CASEL (The Collaboration for Academic, Social, and Emotional Learning) is the process through which children and adults acquire and effectively apply the knowledge, attitudes, and skills necessary to understand and manage emotions, set and achieve positive goals, feel and show empathy for others, establish and maintain positive relationships, and make responsible decisions. Basically, how we learn to get along in the world, understanding ourselves and others. There are 5 competencies that make up social and emotional learning. They are: self-awareness, social awareness, self-management, relationship skills, and responsible decision-making. According to a 2017 study by CASEL, up to 18 years later, students exposed to SEL in school continue to do better than their peers on a number of indicators: positive social behaviors and attitudes, skills such as empathy and teamwork, and academics. And they have fewer conduct problems, less emotional distress, and lower drug use, among many other benefits. It stands to reason then that not only do WE need to be teaching SEL skills, we need to show our FAMILIES how to support SEL skills at home. More immediate success from teaching SEL skills are better grades, improved classroom behavior, an increased ability to manage stress and depression, and better attitudes about themselves, others, and school. The next several Teacher Weeklies will examine each of the 5 competencies. How do you teach them or encourage SEL in your classroom? Let us know!